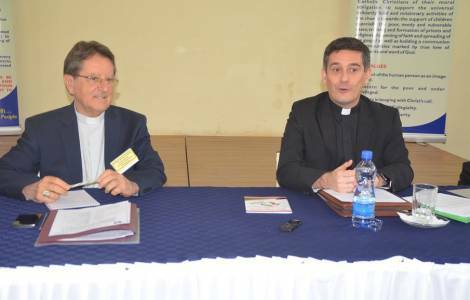 AFRICA/KENYA - Extraordinary Missionary Month: "Faith and charity to bear witness to our faith"
Nairobi (Agenzia Fides) - The Church in Kenya is preparing to celebrate the 100th anniversary of the Pastoral Letter of Pope Benedict XV’s Apostolic Letter "Maximum Illud", by commemorating the Extraordinary Missionary Month of October 2019 announced by Pope Francis. Addressing PMS Diocesan Directors and Pontifical Missionary Childhood (PMC) Coordinators gathered for their Annual General Meeting (held from February 4 to 9 in Nairobi), Chairman of the Kenya Conference of Catholic Bishops Commission for Missions, His Exc Mgr.Joseph Alessandro, Bishop of Garissa, expressed hope that, Kenya shall be able to reawaken the missionary spirituality in all the baptised Catholics and endear to them to courageously bear witness to Christ in the contemporary world. "We need to share out our faith and believe in God. Faith is strengthened when it is shared, revitalised when expressed and energised when lived authentically", said Mgr. Alexander. "We are called to be on the move, to dirty our hands in the work of the Lord and to have the Church sweating on the streets evangelising not by words but good actions that attract, acts that pulls none believers to ask for whom do you work for: our answer remains for Jesus Christ", he added. Speaking at the same time, In Charge of Affairs for the Nunciature Mgr. Marco Ganci said awakening of the heart of the Christian and reviving the Lord who lives in us is the starting point for every true apostolate adding that, the Holy Father reminds Christians of the importance of re-igniting the heart of those who are called to bring Jesus to parts of the world where Christ is not known or where he is already forgotten.